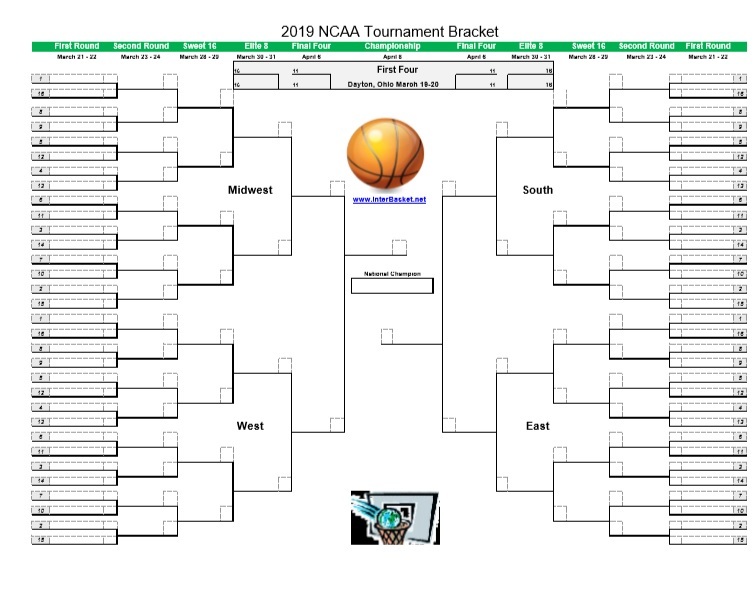 If you are looking for printable NCAA Tournament Brackets for 201 in both PDF and Excel versions, you have found the right place. Everyone is starting to look for a good bracket that they can use this time of year, so you have found the right place to take care of your needs. 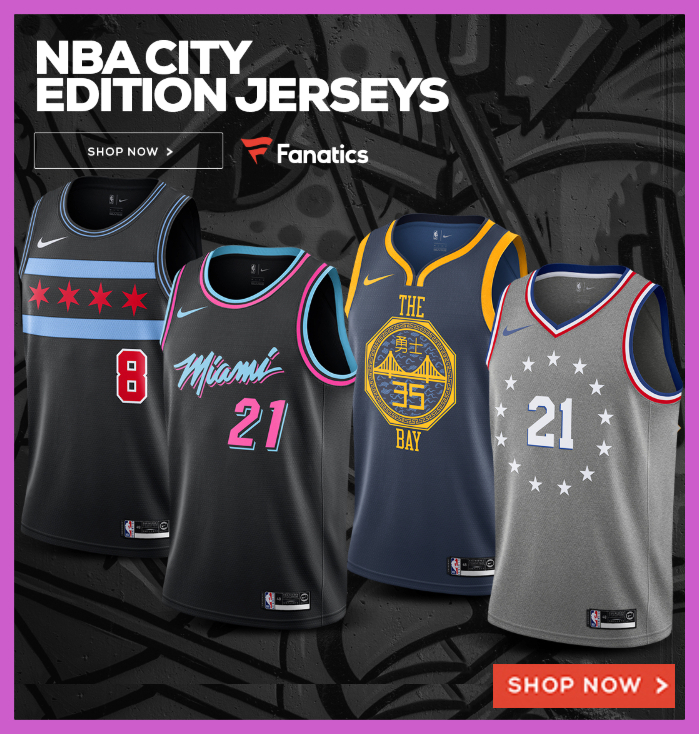 We have also gone through the work to layout some of the better sites around the Internet that you can find good quality brackets as well to best take care of your March Madness needs. Let’s get ready for the Madness! When Do the NCAA Tournament Brackets get Finalized? The NCAA Men’s Basketball Tournament brackets for 2019 will get released on St. Patrick’s Day this year during the live broadcast on Selection Sunday, so expect a lot more drunk revelers this year. And we’ve have already seen some early story lines like Zion Williamson coming back from injury and the biggest surprise during Championship Week was #1 Gonzaga getting upset by St. Mary’s, so who is to say what other upsets or stories we will see in 2019. There will certainly be some snubs as well as some surprises from who ends up in the #1 seeds on down. 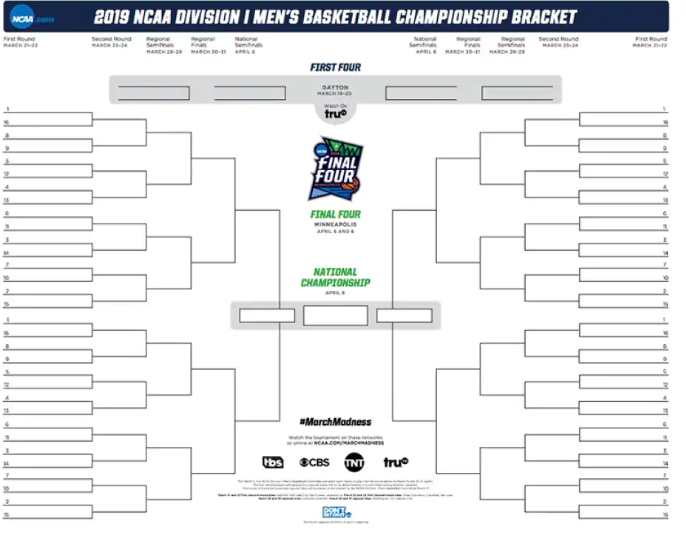 We have included a quality list of some of the nice blank NCAA Men’s basketball brackets for 2019 that you will find on the Internet. The sites that we go through are some of the most reliable over the years, and you will not be disappointed. From the First Four to the Sweet Sixtreen to the Final Four, this year’s tournament promises to be another exciting edition of college basketball action and upsets, joy and sadness, and that one shining moment when the champion cuts down the nets. ESPN continues to be one of the best NCAA Men’s Basketball Tournament Brackets that you can find online. 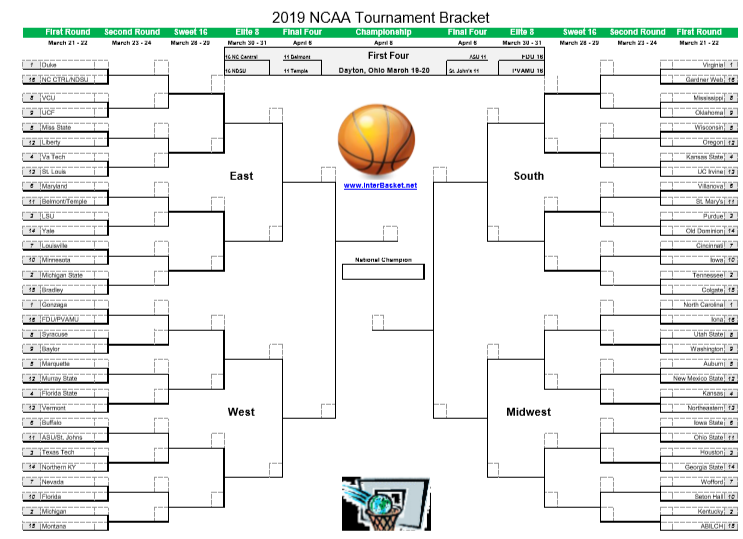 2019 notes another season that you can find a very nice printable and online NCAA Tournament bracket that is free in a variety of formats to include PDF, image, and online. The company will also have a Bracket Challenge for those who want to test their skills against others this season and compete for some nice prizes. Enjoy the Madness! The NCAA.com 2019 NCAA Tournament bracket continues to improve on past year’s products. You will always find the various sponsors on the NCAA’s bracket, but it’s suprisingly non-intrusive and doesn’t get in the way of your bracketology. At NCAA.com, you’ll always be able to print your bracket on a single piece of paper. You can’t beat getting your bracket info from the organization running the tournament as well. CBS Sports continues to be one of the most involved sports networks with the NCAA Men’s Basketball Tournament. 2019 proves to be no different than past seasons. Once the official brackets are released on Selection Sunday, CBS continues to be one of the best places for you to get the latest information on the current matchups, brackets, and more. SB Nation has continued to build and improve on their March Madness coverage over the years. They’ve improved their printable brackets and expanded their news coverage as the site has grown over the years. One of the constants over this time has been their NCAA Men’s Basketball Tournament coverage, and 2019 proves no different. Of course, we always provide you with decent NCAA Men’s Basketball Tournament coverage here on Interbasket. You can check out our 2019 March Madness Brackets in PDF, JPG, and Excel formats. 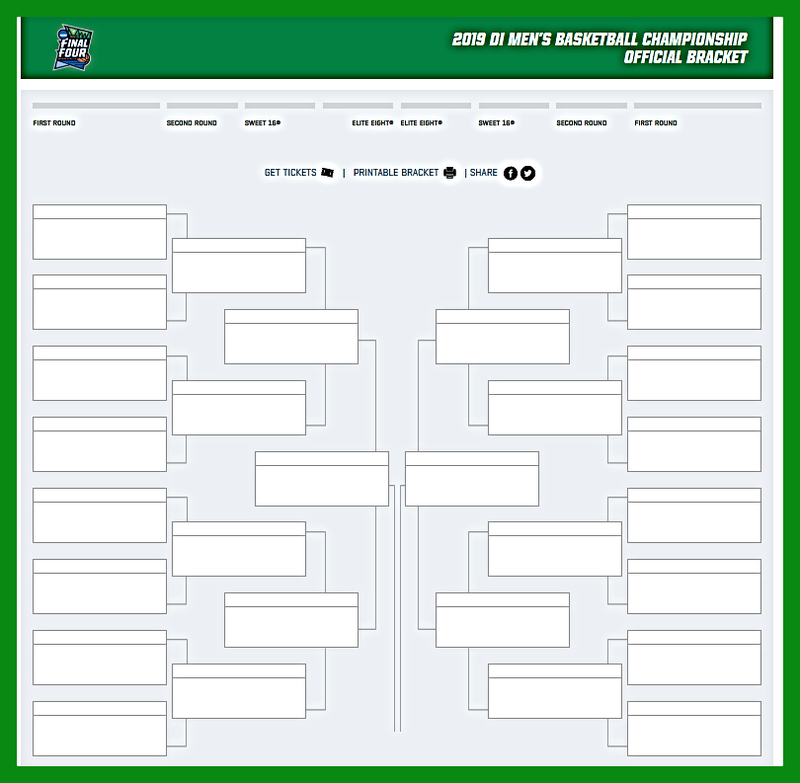 Check out this post for other versions of our printable and blank 2019 NCAA tournament brackets. Click here for the women’s bracket.